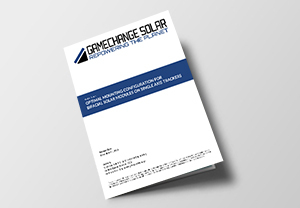 NEW YORK, NEW YORK – December 10, 2018 – GameChange Solar today released a white paper geared towards solar project financiers, developers, and owners who are interested in projects that utilize bifacial solar modules on single axis trackers. The report “Optimal Mounting Configuration for Bifacial Solar Modules on Single Axis Trackers” studies the impact of different mounting configurations on several key project financial metrics. More specifically, the study compares a traditional 1-Up portrait mounting configuration to 2-Up Landscape and 2-Up Portrait mounting configurations at different panel clearances. The impact of these mounting configurations on racking system cost, installation cost, and energy production using the most up to date energy modeling software from NREL, are all accounted for. Bifacial solar modules produce energy from light that hits both the front side and back side of the module. As price increases for bifacial modules are relatively small, the additional energy produced from the back side of the module can have very positive impacts on project financials. However, concerns about accelerated degradation of bifacial modules, shading of the backside of the module and increases to project CAPEX have given developers and solar project owners pause in rolling out this new technology. The GameChange Solar white paper addresses these concerns and determines the optimal way to mount bifacial solar modules when taking them into account. Scott Van Pelt, Sr. Director of Engineering at GameChange Solar, stated: “We believe the information and conclusions in this report are timely and important for the solar industry as more and more developers and project owners look to bifacial modules as a way to improve the financial returns of their projects”.